There are two kinds of people in this world: Those who rush to install every new software update that Apple offers up, and those who hold off to make sure the coast is clear before they click the Install button. Some aggressive installers who were quick to install Mac OS X Lion 10.7.3, released Wednesday, encountered a troubling bug that surely left the “wait-and-see” crowd prouder than ever to be patient. 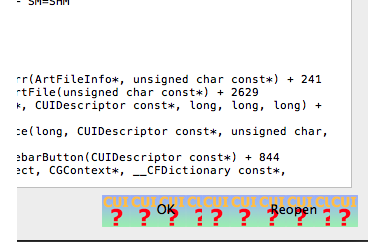 Some folks who installed 10.7.3 via Software Update—using the traditional update approach—discovered upon rebooting that every app they launched would crash, and the ensuing error dialog box sported bizarre overlays: gradient boxes reading “CUI CUI,” along with bright red question marks. We’ve reached out to Apple for an explanation of what went wrong, though the company hasn’t immediately replied. A discussion thread at the company’s support forum has swelled to more than 130 posts about the issue. Macworld spoke to an affected user who responded to us on Twitter. Thomas Scrace told us via email that he installed 10.7.3 via Software Update, and encountered both issues described above: “If you try to open ANY application, it crashes immediately,” he wrote. The good news is, there's a fix. The bad news is, it isn't simple to perform. The combo updater—the version that could also update older versions of Lion—seems to resolve the issue for afflicted users. The problem, however, is that getting the installer to run can be a bit of an issue, if your Web browser crashes each time you try to download it. Writes Scrace, “I have since fixed the issue by starting my computer up in FireWire Target mode and connecting it to another MacBook Pro.” To launch target disk mode, hold down the T key when your problematic Mac boots up. Download the Combo Updater from a different, working Mac, and then install it to the troubled Mac over FireWire. It’s worth emphasizing that while many users are afflicted with this issue, many more have installed 10.7.3 without any trouble. We’ll report back if we hear more from Apple on the problem.